The new pneumatic contant heat sealer is unique,because the actual sealing pressure is now strong,consistent and controllable . Helpful in sealing application where time and pressure need to be regulated. 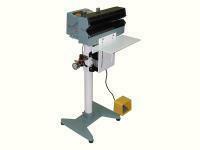 These unique sealers are quieter in that the clanging noise found in most other automatic sealers is reduced..